This tree to 8 m tall is a weed in some areas of the country, it is deciduous to semi-deciduous, leaves lobed and divided to about halfway. Flowers vary in colour but pink or purple are the most common colours. 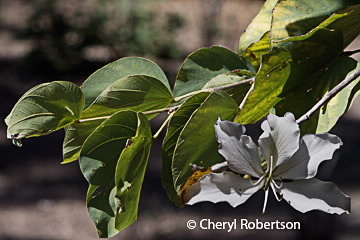 However there is a white variety ‘alba’ which is known as the White orchid tree. Pods 15-25 cm long, explosively dehiscent.